Shaun Of The Dead. Hot Fuzz. Simon Pegg. Nick Frost. Edgar Wright. Yep, they put the band back together, alright, and the results are pretty much what you'd expect. 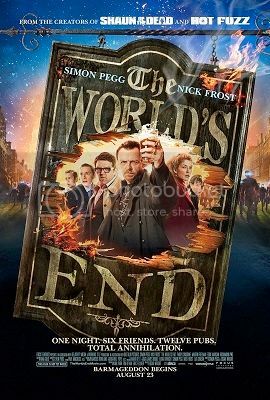 The World's End is a smart, witty, funny movie that holds up fairly well dramatically and features some excellent performances from everyone in the cast. Something's off. Just a bit. And I think I know what it is. Simon Pegg's character - the lead in the story, of course - is an unlikeable loser. Nick Frost actually has the best role in the movie this time out. Both of these guys are extremely talented, and both give fantastic performances in The World's End, but the tone of the movie is off, somehow. And I honestly think it comes down to the fact that Simon Pegg's character in the movie, Gary King, is just unlikeable, and is a complete loser in an arrested state of development. He is perpetually the same guy he was at 18. He hasn't grown, he hasn't grown up, and he isn't really much of a nice guy. The character doesn't have much going for him other than Pegg's bravura acting job in the role. He's over the top without going too far over the top. He almost makes The King likeable. Almost. The story is good (five friends set out to relive their final night together as a group, only they want to get it right this time - but something is amiss in their hometown, and over the course of their journey they find out exactly what that is). The acting is good. The direction is good. And the script is good. All of it is very good. Except the main character. Making your lead an annoying, unlikeable loser and having it not hurt the movie is always a challenge. It's been tried before, and more often than not the attempt ends in failure. The World's End is as close as you can come to having it all work without achieving complete success as is possible. They really came close to pulling it off. So close that the movie is still fun, funny, and even thought provoking at times. The movie is still something of a success. It's entertaining as hell for the most part, and there are plenty of laugh out loud moments along with those thought provoking moments. 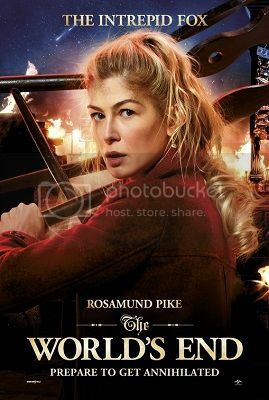 But after the sheer brilliance of Shaun Of The Dead and Hot Fuzz I really expected a knockout. A home run. A game winning goal. A last second touchdown. Instead I got a winner, but the win (over being a poor movie) isn't as overwhelming as I had expected. Still, even though this is the weakest of the three movies this team has made it is a wildly enjoyable movie (for the most part) anyway. I just hope that they get the band back together at least one more time to see if they can avoid any major flaws such as the script concept in The World's End (the concept being, "The main character is an unlikeable loser, but the audiences like him anyway"). Other than that flaw The World's End really comes through big time. I agree with you, Erik. 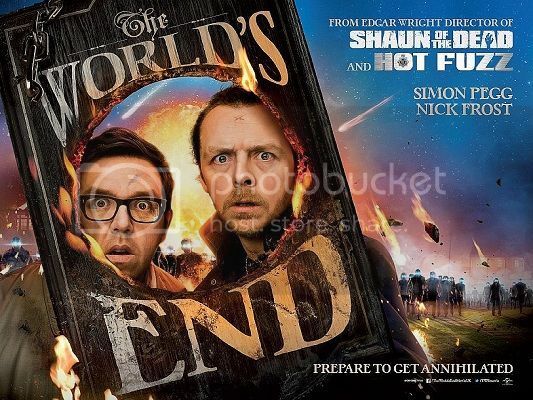 The only time I actually liked Simon Pegg's character was in the final half hour. When he appeared as the water drinking protector of the robots, I cheered. Nick Frost stole the show in my opinion. Have to put 'WE' a distant third after SHAUN & HOT FUZZ. Hope the extras are good & plenty on the DVD & BLU-RAY.